Kilmarnock want to sign Kieron Freeman. 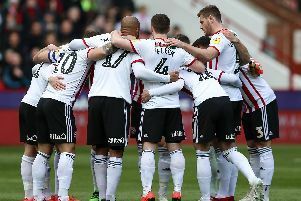 The Sheffield United full-back is Gary Locke’s leading target as he attempts to address the defensive issues which have undermined the Ayrshire club’s battle for Scottish Premiership survival. But Locke, who The Star understands registered his interest with Bramall Lane’s hierarchy earlier this week, fears Freeman could wait until the end of the transfer window before revealing whether to move north. United manager Nigel Adkins is unlikely to stand in the 23-year-old’s way after confirming he is looking to offload players ahead of next month’s deadline. Financial constraints at Rugby Park mean Kilmarnock are unable to recruit Freeman on a permanent basis but money is thought to have been made available to cover the costs of a long-term loan. Locke, who is also monitoring Crystal Palace centre-forward Sullay Kaikai, is expected to press the former Wales under-21 international for an answer ahead of this weekend’s crucial fixture against Dundee United and is prepared to accelerate negotiations by guaranteeing him first team football. Despite playing regularly at the start of the campaign, Freeman has not started a senior fixture for United since November and, barring a major selection issue, is unlikely to be included in the 18 man party which hosts Swindon Town on Saturday. Adkins, speaking earlier this month, acknowledged he is looking to trim the options at his disposal to create room for “a couple” of new additions and ensure United comply with their Salary Cost Management Protocol obligations. Michael Higdon is also believed to have been informed he can move elsewhere after completing a loan spell at Oldham Athletic while Adkins will attempt to place youngsters Terry Kennedy and Dominic Calvert-Lewin with clubs to aid their development. Chesterfield could offer Kennedy first team football while Conor Dimaio boasts admirers at the Proact Stadium. Midfielder James Wallace and striker Marc McNulty have joined Shrewsbury Town and Portsmouth respectively on temporary deals.